The QOS 8 Mini is the lightest member of the QOS series storage disk arrays. The QOS 8 Mini is a small transportable RAID system utilizing small 2.5” drive or SSDs. The QOS 8 Mini achieves almost the full speed of each drive, setting a new standard in performance. The QOS 8 Mini is the lightest member of the QOS series storage disk arrays. The QOS 8 Mini is a small transportable RAID system utilizing small 2.5” drive or SSDs. The QOS 8 Mini achieves almost the full speed of each drive, setting a new standard in performance. With little to no moving parts in the drive enclosure itself, the noise level it reaches is very low. The QOS 8 Mini uses the same software RAID engine as the other QOS server systems, but its small size and low cooling requirements make it the perfect storage device for taking your data with you on the road. The 8-Bay Mini allows users to safely and securely transport their data from place to place while also standing up to the high demands of post-production RAID systems. 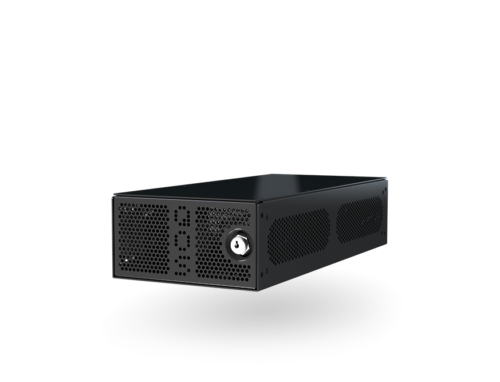 The 8 Mini is half rack size, so individual drive bays can be removed from a rack and then easily transported. This makes it possible for unheard of data transfer and copying speeds from a QOS or third party RAID system over high-speed optical interfaces such as 10Gigabit Ethernet, 8 or 16Gb Fibre Channel. An excellent solution for customers who need fast storage speed that’s extraordinarily lightweight and mobile. Supports 1GbE, 10GbE, 40GbE and 4,8 and 16 Gb Fibre Channel connectivity.